This is the story of a greyhound named Sam Spade who came back to GreySave Greyhound Adoptions on Mother’s Day 2018. On Friday evening, just before Mother’s Day, Sam somehow ended up with a de-gloved or peeled back ankle. It made a complete ring about 1.5 inches wide and left no skin around his back ankle. His adopter took him to a local ER but they really did not know what to do for him, what Sam’s prognosis was or more importantly the cost. 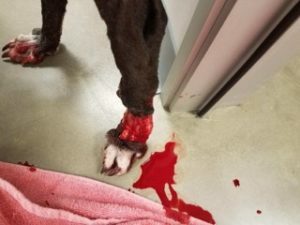 As the adopter pondered euthanasia, GreySave took Sam back and moved him to a specialty vet in Irvine, Calif.
Sam has been there about 30 days now. He has been in special bandages to identify the necrotic skin, has had a skin graft and now is hoping to get out soon and go to a medical foster home. 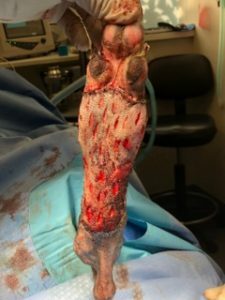 The specialized vet bill is estimated to be at least $12,000. Ouch! Sam is one of GreySave’s greyhounds that you might be helping by buying a bracelet or three. 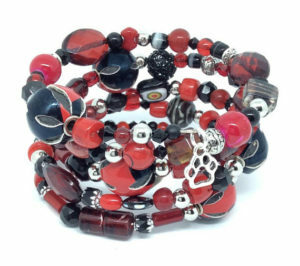 Bracelets are one-of-a-kind and make great gifts for yourself or friends especially when they learn that your gift helps hounds in need. If you don’t want to buy a bracelet, please consider making a direct donation to help pay for Sam’s vet bills. GreySave supports all its adopters, even after they have adopted their dog, with advice and training help, should they need it. 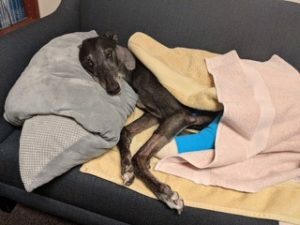 Occasionally, an adopter has a crisis, such as illness in the family or an expensive greyhound medical crisis and has to relinquish their greyhound. In which case, GreySave will always take the greyhound back, provide any needed medical attention and then find a new home for them as needed.